Book (2013) "Derivatives Analytics with Python"
It is best to use either the Python distribution Anaconda or the Web-based analytics environment Wakari. Both provide almost "complete" Python environments. As a simple example let's generate a NumPy array with five sets of 1000 (pseudo-)random numbers each. Let's plot a histogram of the 1st, 2nd and 3rd data set. We then want to plot the 'running' cumulative sum of each set. Some fundamental statistics from our data sets. 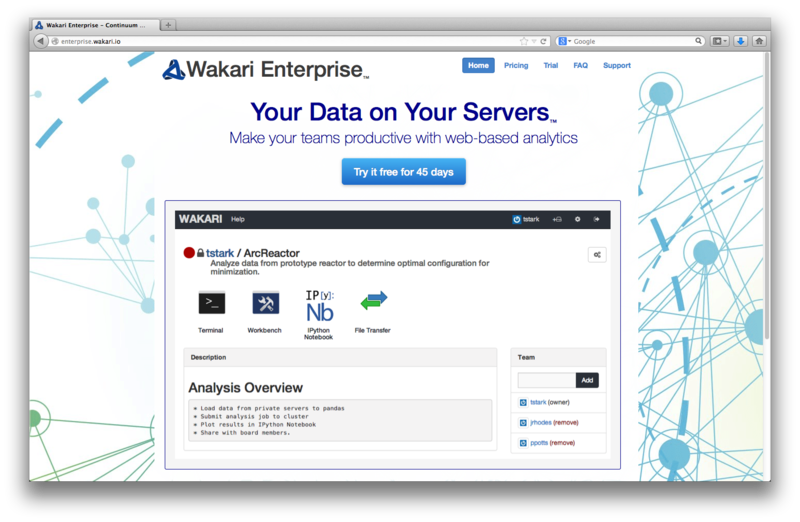 One of the easiest ways to deploy Python today across a whole organization with a heterogenous IT infrastructure is via Wakari, Continuum's Web-/Browser- and Python-based Data Analytics environment. It is availble both as a cloud as well as an enterprise solution for in-house deployment. """Autosave the notebook every interval (in minutes)"""